Synopsis: The movie opens with Lulu arriving in Singapore from her hometown in China looking for her one true love that she met on social media. However, her dream lover turns out to be the complete opposite of what she imagines him to be. Not wanting to 'lose face' to her friends back in China, she decides to stay in Singapore and make something of herself. We follow her adventures of job-hopping, learning English and being discovered by the TV station. She gets the opportunity to front n English fashion program despite having 'unique' fashion sense and even more unique command of the English language. She refuses to conform to normal standards of what a fashion host is supposed to dress or sound like but audiences love her unconventional way of hosting and her show becomes top-rated, even garnering international attention. Her real adventures begin as she embarks on her journey around the world (from London to Shanghai) as a bona fide fashionista. Throughout her journey, although she meets with mockery, discrimination and tough times, Lulu refuses to give up or compromise. A strong message that comes across in the movie is that one can achieve success by staying true to oneself and living life on one's own terms. 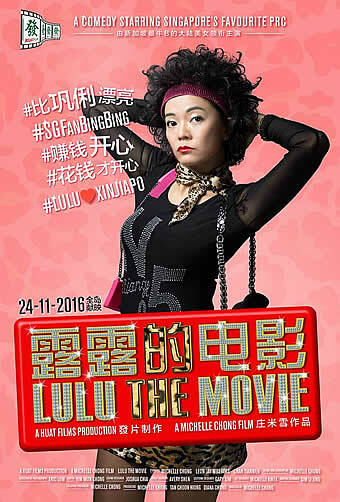 As one of the supporting characters of the satirical news programme ‘The Noose’, Michelle Chong’s over-the-top portrayal of the fictional PRC KTV hostess named Lulu was one of its best and most memorable acts; as the subject of a feature-length movie however, Lulu turns out not only horribly dull but also a terribly unfunny caricature. Oh yes, after close to a year of teasing, writer-producer-director Chong has finally readied her big-screen treatment of Lulu, and the result is anything but funny; in fact, it is such a painfully unfunny watch that one wonders why Chong even bothered. The paper-thin premise has Lulu travelling from Shanghai to Singapore in search of her local beau on Weibo named Brad Pit, whom she believes is dashing like Leon Jay Williams but turns out dorky like Chen Tianwen, complete with a potbelly and thick-rimmed black glasses. Not only that, Lulu discovers that Brad Pit doesn’t stay in a bungalow as his photo had promised, but in a rundown second-storey unit above a coffeeshop in Geylang Lorong 33. Disgusted and disappointed yet resolute to make her own life, Lulu starts out by taking multiple jobs like a hairdresser, a waitress and a kindergarten teacher – though the one that will change her fortune is none other than that of a hostess at the now-defunct Tiananmen KTV. As much as you may like Lulu’s movie to be about her transformative journey through grit and self-determination, the truth is far from that. Indeed, Lulu may go from an unsophisticated country bumpkin to an Internet sensation with her own fashion programme, but that accomplishment is more a result of narrative contrivances than anything else. How else would Lulu’s dream beau Leon just happen to be a regular at Tiananmen out of all the other KTVs in Singapore? Or how Leon’s snobbish and ill-tempered girlfriend Sonia (also played by Chong) would just happen to be the host of the fashion TV programme whose producers decide to replace with Lulu? But more fundamentally, the story is grossly under-developed. Whereas there is hint of possible sibling rivalry between Brad Pit and Leon for Lulu’s affections early on,, that dynamic never comes to pass – and for that matter, both characters are pretty much sidelined most of the time, so much so that it is never even said how the former’s feelings for Lulu evolves as she becomes famous and taken for granted why the latter would fall for Lulu. Conspicuously absent too is how Sonia reacts to being replaced by Lulu, whether on her programme or as Leon’s object of affection. It is downright perplexing why there is simply no attempt to develop any of these supporting characters or their relationships with Lulu. In fact, the same can be said of Lulu, who remains frustratingly opaque despite having a whole movie to herself. Alternating between being earnestly bumbling and brazenly self-confident depending on what fits the situation for maximum laughs, Lulu never emerges as a fully-formed character in her own right because of such inconsistencies. There are hints here and there of how Lulu strives to be her own woman (such as standing up to Leon when he suggests that she be more sophisticated like Sonia), but her resolve is never quite coherently or compellingly portrayed. Nor for that matter how her overnight success changes or affects her, again only hinted by her wistful stares or lonely asides. Such poor at best, appalling at worst, characterization is not even excusable as a natural consequence of how the movie follows ‘The Noose’s’ structure as a hodgepodge of loosely connected skits, precisely because these individual sketches are not nearly as funny at all. In fact, the best that this movie can muster is already in the trailer – and that is, of Lulu’s English lesson with a bunch of preschool children where she mangles the meaning and pronunciation of words that rhyme with ‘lace’. Not quite as amusing as it should be is Lulu’s outrageous dancing to the hip-hop tune ‘A-wah’ by a certain Chinese band named China Wine (get it? ), especially since it is supposed to mark the turning point in Lulu’s fortunes. If it isn’t clear yet, Lulu’s drive to be better than the self-absorbed persona we have come to know her as ends up at odds with the character’s chief source of humour, given how part of that drive involves her taking English lessons (from an English-language school called Brilliant Minds run by the opportunistic Henry Thia no less). 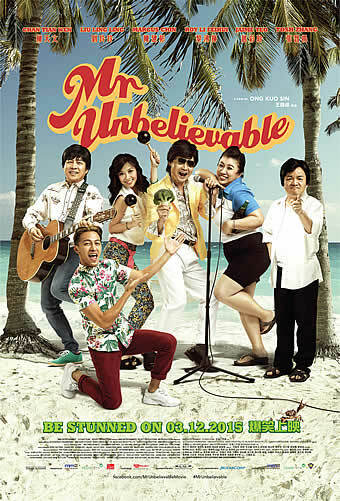 Like most, if not all, of the movie itself, the result is half-hearted and ultimately incoherent – one moment Lulu seems to have matured beyond her PRC Mandarin-accented English days, and the next she is back amplifying those worst tendencies to get us laughing at her same old ways again. Playing multi-hyphenate roles as she did with her modestly successful directorial debut ‘Almost Famous’ and sophomore feature ‘Three Peas in a Pod, Chong deserves blame for her film’s abundant shortcomings. Her directorial instincts are as raw as an amateur gets – not only do individual scenes make little sense next to one another, but there is also no articulate flow to the narrative, such that the whole movie feels like a drag from start to finish. She is also no Larry Charles (or Sacha Baron Cohen for that matter), and the Borat-like vignettes filmed in London (after Lulu inherits the mantle of ‘Sonia Talks Fashionh’) are largely tedious and humorless. Truth be told, ‘Lulu the Movie’ is exhausting to sit through. Not only is it a barely formed movie, it is a badly formed movie with a bare-bones narrative, little to none character development and surprisingly witless jokes that can’t even match that of the Youtube clips which have made her character so popular and endearing in the first place. There used to be good reason for us to set aside our politeness to laugh at a character formed through and through on nationalistic stereotypes, but this portrait of Lulu offers us almost no excuse to do so. Given how blatant the product placements are, we can only imagine Michelle Chong must have needed to account to her sponsors as the only reason why she decided eventually to finish this long-gestating movie.